This video collection stars four Sign Language performers and storytellers -Freda Norman, Mary Beth Miller, Lou Fant, and Patrick Graybill. Their well-known creativity, artistry, and skills have never been more apparent than in these tapes. In this five-tape series they celebrate the spirit of storytelling and story signing with true brilliance. 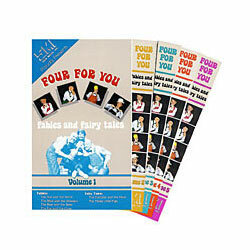 Each volume contains four Aesop's fables and two classic fairy tales. Each videocassette is approximately 60 minutes long.